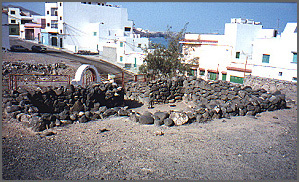 El Agujero and La Guancha "Beyond the Beaches of Gran Canaria"
This urban territory and acropolis is a Prehispanic site of stone houses and communal tombs by the sea. It is now also on land coveted by developers, surrounded by modern houses and banana plantations. The Canarians built their houses near the sea with dry stones, stacked without any mortar. The structures consist of a double wall (the space between the walls filled with small stones) providing support and insulation from the weather. The rooms of the houses are formed in the same cross-shape as those of cave homes found elsewhere on the island. The roofs of the buildings, no longer preserved, were probably made of wooden beams, branches, or sod. These structures are found in clusters at many places near the ocean in Gran Canaria (see also Tufia). Most likely they were part of fishing communities that were occupied seasonally.